Set Constant (S=C Plus) length tolerances that are closer than industry standard matched-set tolerances, regardless of the date manufactured. OMEGA timing belts feature a tooth profile the fits HTD and RPP pulleys, while reducing noise levels with its innovative tooth profile and bonded fabric cover. Maintenance-free RED POWER 3 V-belts are the only belts in the industry to achieve this level of performance and durability. RED POWER 3 can transfer up to a 50% more power than standard v-belts of the same size. 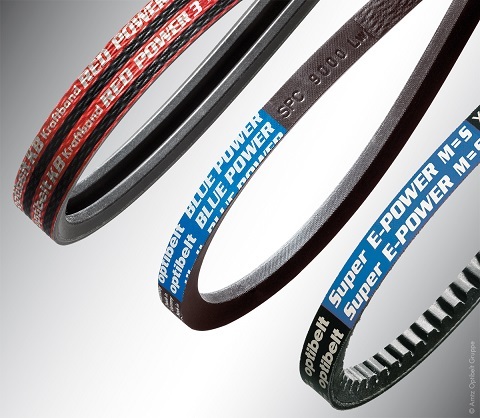 HVAC POWER combines OPTIBELT's advanced fabric wraps and cogged v-belt flexible cord layer. This created a fractional horsepower v-belt that can withstand extreme temperatures, dramatically reduce maintenance intervals and has a flex range comparable to cogged belts. BLUE POWER V-belts lead the industry in horsepower rating and durability by combining the power or aramid cord, advanced transverse fiber core, and bonded fabric cover.